UNICEF youth climate advocates attend the UN climate change conference in Paris, France. 2 December 2015. A digital mapping project called ‘Act Now For Tomorrow,’ which was recently launched by the United Nations Children’s Fund (UNICEF), is helping young people around the world identify climate issues in their communities and find ways to address them. “The global climate map is engaging 500 young people from 65 countries,” Zayn Abaakil, a UNICEF child engagement coordinator, told the UN News Centre in one of the conference halls of the UN climate change conference (COP21) where dozens of innovative climate projects are being showcased over the next two weeks. The idea behind the project, she said, is for young people to show the link between climate issues and the impacts they see every day that are affecting their health and access to education. The UN agency recently reported that more than half a billion children live in areas with extremely high flood occurrences, while 160 million are in high drought severity zones. Seven UNICEF youth ambassadors have travelled from all corners of the globe to attend COP21, display their findings, and exchange stories – this time in person. One of them is Andozile Simwinga, a driven18-year old Zambian student who said the impacts of climate change on his country are affecting his self-esteem. “Things, they don’t actually move the way they’re supposed to move and young people are not happy the way they should be,” he said energetically. Despite talking about an issue that clearly causes him distress, Mr. Simwinga couldn’t hide the enthusiasm he feels being in Paris and contributing to this global event. Meanwhile, 22-year-old Bellinda Raymond traveled from Malaysia to attend the Conference of Youth prior to heading to COP21. She described herself as an active citizen, someone who engages with members of her indigenous community, especially ahead of major weather events that have the potential to destroy homes and vital surroundings. She said her grandparents weren’t affected by climate change in the ways she is today. “As an indigenous person, we depend on the forest and rivers for our daily life – and we also have our traditional system, also related to the climate. The weather is now unpredictable and we need to adapt to the environment that’s changing,” Ms. Raymond said. Asked what the worse effect of climate change has been on her community, she answered floods. 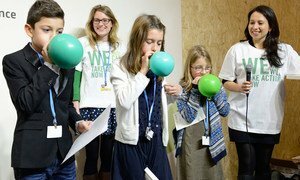 As youth ambassadors celebrated ‘Young and Future Generations Day’ at COP21 on Thursday, government delegations continued to negotiate a new climate agreement which the world’s people hope will be ambitious enough to limit global temperature rise to below 2 degrees Celsius, and prevent further degradation of the planet. The halls of the United Nations climate change conference (COP21) grew livelier today as hundreds of participants gathered to mark “young and future generations day,” an opportunity for youth to remind world leaders and negotiators of the need to reach an ambitious climate agreement to secure their future, according to the UN Envoy on Youth.